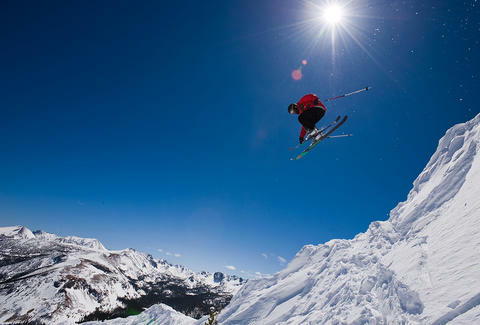 Switch up your next ski trip by taking it to Mammoth Lakes. It's so accessible, you might just get there faster than it would take you to commute to work, but the benefits are way better than Doughnut Friday at the office. Oh, and no matter how good that doughnut is, its powder can't compare to the snow that blankets Mammoth Mountain over its extended winter. A half-hour plane ride is all that stands between you and two million acres of undeveloped nature. Nonstop evening flights to Mammoth Lakes run from San Francisco, December through March. Relax and enjoy the scenic views of Yosemite National Park, Mono Lake, June Mountain, and Mammoth Mountain itself before landing. Meanwhile all your coworkers are crawling into the first of many hours of traffic to other resorts. Heck, if it's that easy, why wait for the weekend? Maybe after work, you should light out for points east, then call in sick tomorrow and play hooky. Everyone loves skiing, but everyone hates long lines of traffic to get to the resort, longer lines of newbies at the ski lift, and the longest lines of all at the bathroom. (Ski pants aren’t easy to get out of, now are they?) Alpine Replay, an app that compiles users’ ski stats, puts Mammoth Lakes in its top 30 list of time spent skiing vs. time spent in line, and it was the #1 entry for California. The 9,000-foot elevation of the Main Lodge gives it a natural advantage in nabbing more snow. This year the slopes have been open since November 10th, long before other resorts opened. With a longer winter, you not only have the chance to satisfy your ski fix before too long a lull passes, you can enjoy it long before and after many other resorts have given up for the season. Mammoth Mountain traps snow clouds to form its long and lovely winter. That means it doesn’t merely snow for a longer portion of the year, it also snows more often within that timeframe, and, as is quite usually the case, results in deeper snowfall. (That’s like finding a candy bar inside your death-by-chocolate hot fudge sundae--but somehow even more joyous, because while sugar makes you fat, skiing makes you fit.) 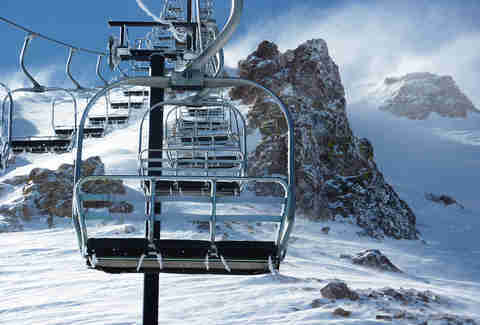 Overall, Mammoth Mountain enjoys an average of 400 inches per year! Even if skiing, snowboarding, and generally being rad to the extreme aren't your thing, you've got options on top of options in the unbelievable Mammoth Lakes region. There are tours via snowmobile, helicopter, and even snowcat! If you want to jump into winter feet first, there's ice climbing, Woolly's Tube Park and Snow Play, ice skating, and free tours of the mountain in the naturalist guide. Cold-blooded? Stay indoors and try out the trampoline club. Or spare an hour at the lanes to enjoy the greatest vista to ever grace a bowling alley. No matter how hard you try, you can’t ski or snowboard all the time. Once your hamstrings have had their fill of the slopes, stroll the town and treat yourself to some outlet shopping, gourmet restaurants, and fun bars with a great community feel. Garb yourself in new clothes and gear, then rejoice in all manner of dining options. The local food scene includes BBQ, sushi, Mexican, Italian, Scandinavian, and more. It’s big city luxury in small-town charm, with gorgeous buildings, and friendly people. Who can blame them? You’d be friendly too if you worked in a place where people can just ski up to the front door. 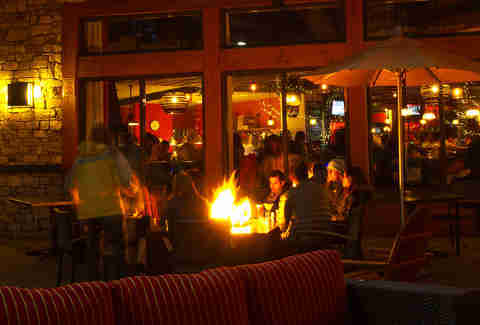 At the end of the day, get sociable by joining your ski compatriots to warm up and relax in front of one of the three fire pits. DJs and (free!) dance parties are always a good time -- especially when they’re situated on a dramatically beautiful mountain. That's right, there's a unique party on the slope itself, where you were skiing a couple hours ago. There’s no more fulfilling way to cap off your vacation than a (again, free!) firework show that unites an entire town in celebration atop a gorgeous mountain. 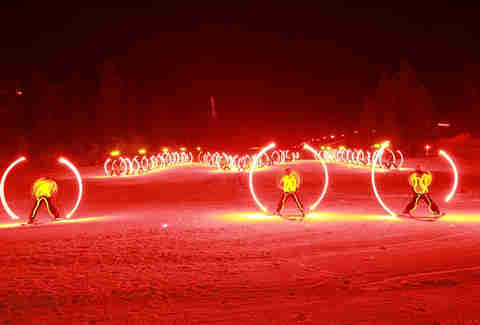 That’s exactly what you’ll be getting if you attend Mammoth Lakes’ Night of Lights on December 17th. With free gondola rides up to the event (and snowmobile rides when you get there), it’s a fun way to kick off the holiday season. There’s also a torch parade, and how many times do you get to enjoy one of those? After that commences, the dance party on the snow begins!